11th St. Bar has an incredible back room that will be perfect for your next event. The space is great for small gatherings or huge blowouts. For inquiries about possible reservations please fill out the form or call the bar at (212) 982-3929 between 2 pm and 8 pm. The second performance of a four month residency for The Hugh Pool Band playing on the third Thursday of each month. Hugh is a musician, songwriter, producer, and member of the New York Blues Hall of Fame who plays guitar in a unique style that melds traditional Delta blues, country music and classic and psychedelic rock and roll. His instrument of choice is a National Steel Triolian, a resonator guitar somewhat like a Dobro, played with a spark plug wrench through an Ibanez TS-9 overdrive pedal and a Dunlop Dyna comp compressor. He also plays Harmonica, Banjo, Lap Steel, Mandolin, sings and plays standard electric guitars. He is joined by Keith Robinson on drums and Ken Rich on Bass. http://www.hughpool.com. Pierce is an singer-songwriter from Wexford, Ireland. After forming a duo with Larry Kirwan he went solo in the mid-1980s and has since released several albums to critical acclaim. http://www.pierceturner.com. The third performance a four month residency for The Hugh Pool Band playing on the third Thursday of each month. Hugh is a musician, songwriter, producer, and member of the New York Blues Hall of Fame who plays guitar in a unique style that melds traditional Delta blues, country music and classic and psychedelic rock and roll. His instrument of choice is a National Steel Triolian, a resonator guitar somewhat like a Dobro, played with a spark plug wrench through an Ibanez TS-9 overdrive pedal and a Dunlop Dyna comp compressor. He also plays Harmonica, Banjo, Lap Steel, Mandolin, sings and plays standard electric guitars. He is joined by Keith Robinson on drums and Ken Rich on Bass. http://www.hughpool.com. The final performance of a four month residency for The Hugh Pool Band playing on the third Thursday of each month. Hugh is a musician, songwriter, producer, and member of the New York Blues Hall of Fame who plays guitar in a unique style that melds traditional Delta blues, country music and classic and psychedelic rock and roll. His instrument of choice is a National Steel Triolian, a resonator guitar somewhat like a Dobro, played with a spark plug wrench through an Ibanez TS-9 overdrive pedal and a Dunlop Dyna comp compressor. He also plays Harmonica, Banjo, Lap Steel, Mandolin, sings and plays standard electric guitars. He is joined by Keith Robinson on drums and Ken Rich on Bass. http://www.hughpool.com. 11th St. Bar is the long-standing Official home of the New York Liverpool Supporters Club. Although LFCNY has expanded their reach with new bars, membership is still handled exclusively at the 11th St. Bar (on match days only). The bar typically opens one hour before each game. Please check our events page for exact times. We do not accept reservations. It is first come first serve until we hit our capacity of 125. Anyone can come to the bar, but if you are under 21, you must be accompanied by a parent or guardian. For big games, we would always recommend getting to the bar as early as possible to gain entry. We can’t tell you exactly how early to get here as it varies every game. 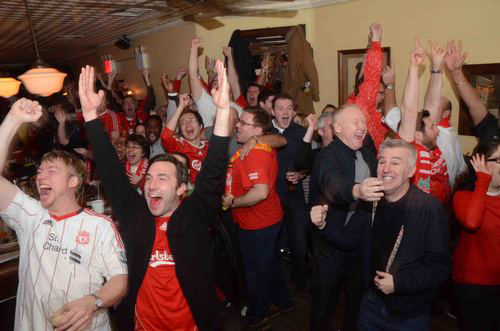 11th St. Bar itself is becoming quite famous in Liverpool and is on the list of tourist attractions for visiting fans. On game days the fans tend to be exclusively Liverpool fans, though opposing fans are also very welcome. Game days are well worth the visit, especially the big games with all the singing, chanting, and excitement associated with the great tradition of Liverpool Football Club. You’ll Never Walk Alone at 11th St. Bar! The last time I was there was 10 years ago and the bar still rocks. Great beer and better service. The bartender was sharp and helpful. Favorite East Village bar, heck, great bar anywhere. Fantastic bartender, great vibe, live music. Pretty perfect.